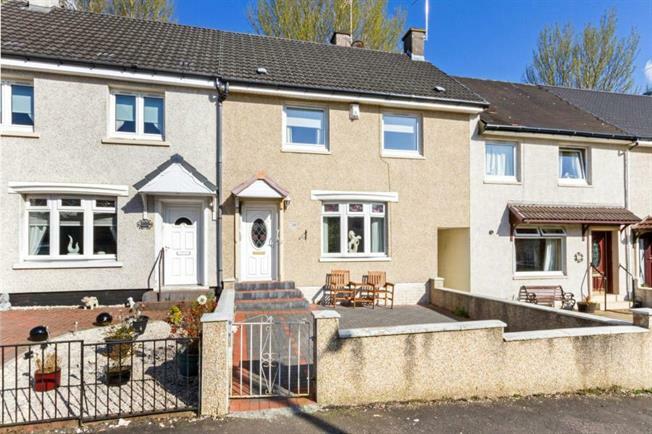 3 Bedroom Terraced House For Sale in Glasgow for Offers Over £105,000. Immediate internal viewing is of paramount importance to fully appreciate this larger sized mid terrace villa which is set within this popular village setting and offers ideal accommodation for today's young couples and families alike who require to be located within close proximity to a wide range of amenities which include both primary and high schools, local shops, public transport facilities and easy access to Glasgow and beyond via both motor and railway networks. This superb mid terrace villa which is offered to the market in walk in condition comprises entrance hallway, spacious lounge, luxury fully refitted kitchen, upper landing, three good sized double bedrooms and converted bathroom offering shower room. The property benefits from gas central heating, double glazing, enclosed garden grounds to front and rear with paved patio and an abundance of on street residents/visitors' parking facilities.